Whether you're a professional or a novice, we all can benefit from helpful tips and know-how that makes working on our vehicles an easier task. Below are some of our most common tech tips, as well as a rotating selection of maintenance and engine knowledge. There is a debate whether or not to use anti-seize when installing spark plugs. The official position of Autolite on this question is to consult the service manual for the vehicle being repaired and use anti-seize only where the original manufacturer recommends it. The nickel coating on most modern spark plugs provided added protection from seizing in aluminum cylinder heads and has made anti-seize less important in spark plug installations. Anti-Sieze can alter the tightening torque up to 20%, increasing the risk of breakage. It can also create heat transfer and electrical conductivity concerns. 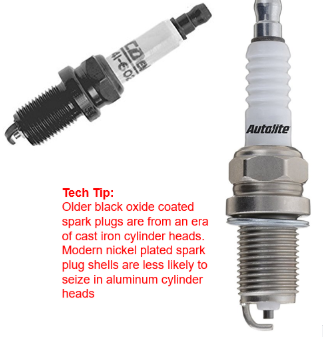 We are often asked about Autolite AR Racing spark plugs and the benefits of using them compared to a conventional copper core Autolite spark plug. The common misconception is a racing spark plug generates more voltage or can produce more engine power simply from installing it. This is NOT TRUE. A racing spark plug allows engine builders and tuners to maximize the power output from their engines by using the spark plug as a tool for adjusting fuel, timing, and other engine parameters to make sure that the engine is safely making maximum power. What are Racing Spark Plugs and when should they be used? Racing Spark Plugs are not indended for daily driving, low speed use. They are designed for high RPM and continuous wide-open-throttle use. Often we open the hood and perform a visual inspection while the vehicle’s engine is running. Checking the dipstick, listening for out of place sounds, or maybe just letting your friends swoon at all that horsepower! However, always keep any eye out for others! People like to point at a spinning serpentine belt, or maybe a new part is dropped behind the fan shroud. When your engine is running, make sure everyone is thinking safety. We are sure you have seen this before! We cannot tell you how many times we have found someone has left a long lost 10mm wrench just chilling on the quarter panel! This is not smart on the wallet and it can be a safety factor. It is not unheard of to find an errant wrench or screw driver that has caused mechanical damage. So, keep your investment safe and sound by not leaving it under the hood when you are done with the day’s task! When your engine light comes on, it may seem easy to condemn the spark plug. However, just because it is easy to replace does not mean it is a faulty component. So, this month we will be talking about OBD II (On-Board Diagnostics). OBD has changed quite a bit over the last 50 years. Volkswagen developed one of the first “Scan compatible” computers in 1968. Since then, computers have helped guide us in Automotive repair in a completely new light. It is always recommended to follow the Autolite Catalog for each engine application. Even though SAE standardizes thread size, I.E. 10mm, 12mm, 14mm and 18mm, spark plugs are not one size fits all. If the spark plug reach is too long, meaning it extends too far into the cylinder head, it is possible to experience a pre-ignition event, thread damage from carbon build up, or severe engine damage from hitting the piston. If the spark plug reach is too short, the shrouded gap may cause a misfire, and carbon may build up on the exposed threads. Remember to always reference the catalog when selecting new spark plugs! Spark Plugs are a precision-made product. Accuracy to the .001” is more than important. One of locations on a spark plug where measurement is critical is the gap. The location between the center electrode and the ground electrode. If the gap is too small, the flame may not have the room it needs to expand properly. 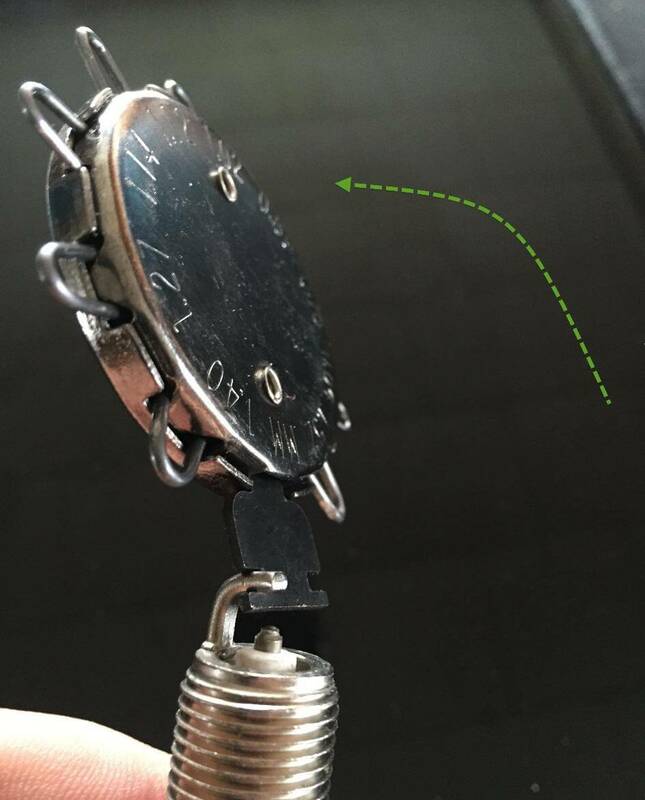 If the Gap is too large, the voltage required from the coil may be too great. So, every toolbox needs to have a gap gauge in it! Even though many spark plugs come pre-gapped, that spark plug has had a long trip to your garage. Below is a picture of a common wire gap gauge. This is our preferred style because when used properly you will not cause any damage to the spark plug. When removing, and especially when installing spark plugs care should be taken not to stress the ceramic insulator of the spark plug. 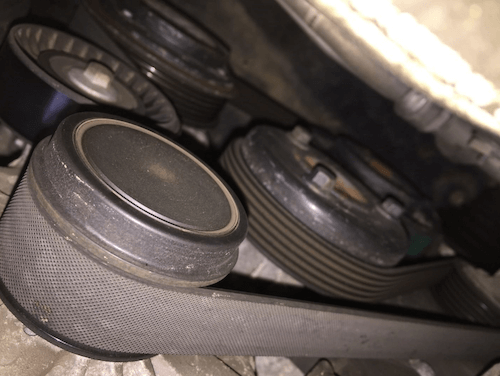 Angular force, from an uneven socket, can cause cracks in the insulator leading to engine misfires and the spark plug having to be replaced again. The easiest way to avoid these concerns is to use a socket designed for spark plug service. Spark plug sockets have a rubber insert that surrounds the insulator and holds it evenly inside the socket during installation. 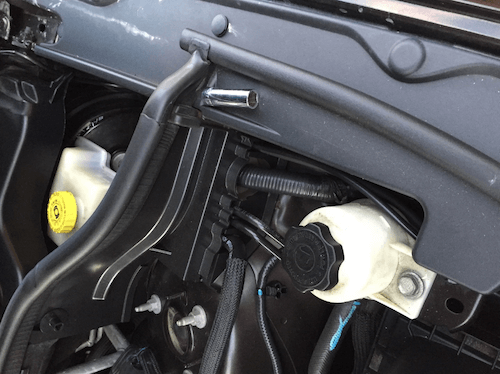 Some spark plugs sockets also incorporate a magnet that will hold the spark plug terminal in place making removal of the spark plug from the engine easier. 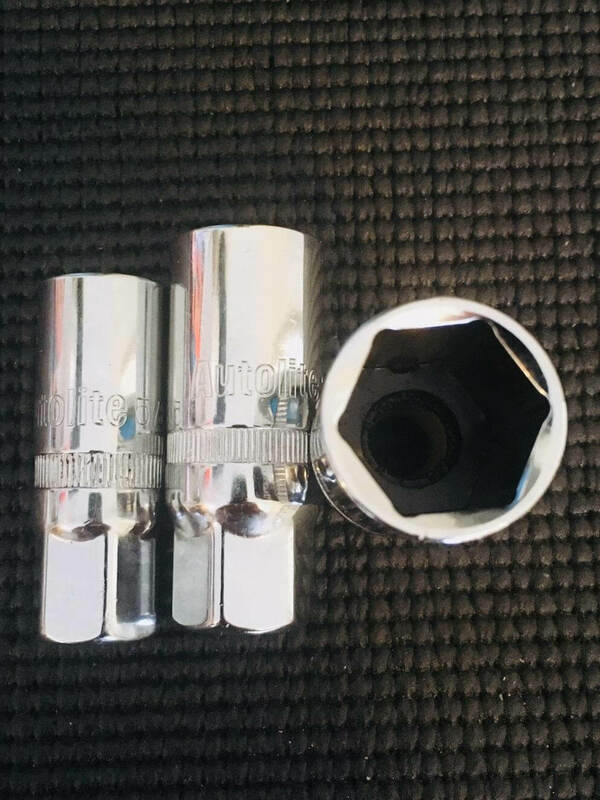 Spark plug sockets will often have a hex bolster on the drive end, allowing the use of a wrench to increase usability in hard to reach locations. Most engines use either 5/8” or 13/16” hex spark plugs, although other sizes are required for some applications. If you’re unsure what size spark plug socket you’ll need for the job you can use the new spark plugs to locate a correctly sized socket while at the store. Many of you have heard the term pre-ignition but may not know what it really is, or what can cause it. Pre-ignition is the premature ignition of the fuel / air mixture in a gasoline engine ; in other words the fuel / air mix ignites before the spark plug is ignited. This can occur if the spark plug heat range is too “hot” for the application, hot spots in the combustion chamber, carbon build-ups in the combustion chamber, lean fuel conditions caused by PCV or oil vapor contamination , low octane fuel, and other contributing factors. 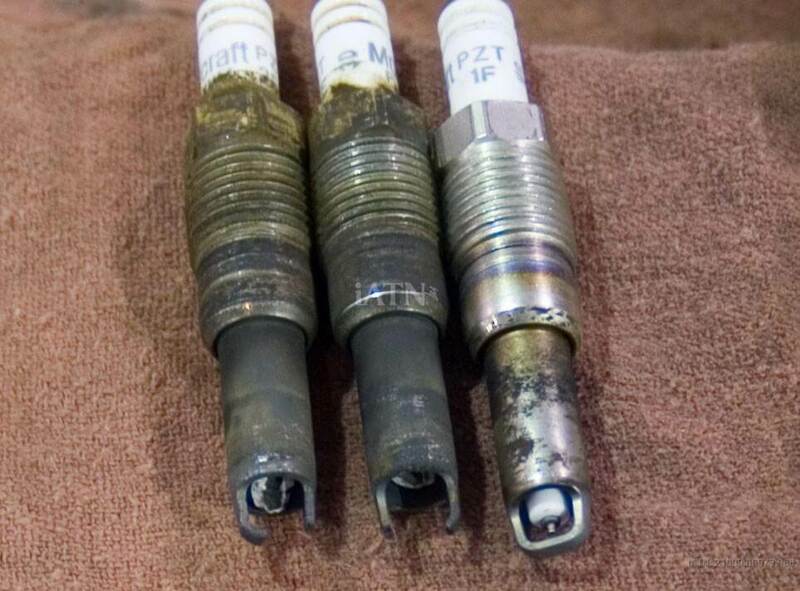 Often times pre-ignition is not caused by the spark plug, although severe damage to the spark plug is the result. One way to prevent pre-ignition and the damage it can cause is to always use the recommended heat range spark plug for your application and maintain your engine’s operating condition through regular maintenance. 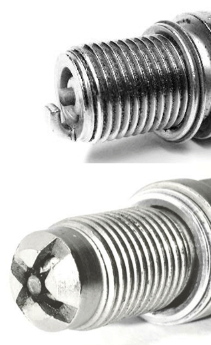 A common sign of pre-ignition is damage to the ground electrode and insulator of a spark plug. Heat range is the measure of how fast the spark plug tip dissipates heat. Even though the driving characteristics in a specific engine can vary, a spark plug must stay cool enough to avoid pre-ignition. However, the spark plug must also run hot enough to burn off any carbon build-up that might collect on the firing tip. The heat is conducted away from the firing tip into the cylinder head in a controlled manner via the length of the insulator. The shorter the insulator path, the quicker the heat is dissipated. The longer the path, the longer it will take the heat to dissipate. The ground electrode conducts heat as well. 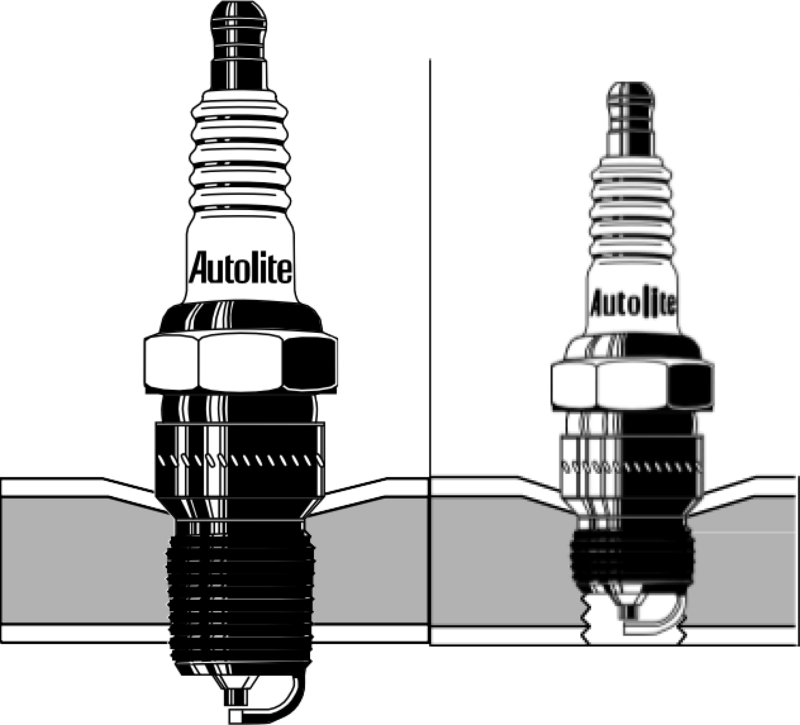 Autolite has developed spark plugs in many different heat ranges to suit all engine applications.